The Queen's Diamond Jubilee barge has been announced as the flagship in a "spectacular" river pageant to celebrate the 800th anniversary of the sealing of the Magna Carta. The Gloriana will join a flotilla of about 200 boats in June on a two-day voyage from Hurley in Berkshire. The route, along the River Thames, will end at Runnymede, Surrey, where the sealing of the Magna Carta took place. 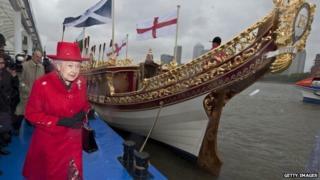 The £1m Gloriana led the Queen's Diamond Jubilee Pageant in 2012. A copy of the Magna Carta will be transported downstream, with actors telling the story of the document. Councillor Eileen Quick, member for leisure at Windsor and Maidenhead council, said: "I am so excited that this wonderful row barge will be part of these spectacular once-in-a-lifetime celebrations." Boat owners have until 28 February to register to take part in the event on 13 and 14 June.